This is a cake made of pure luck as it seems. One bight of this chocolaty delight and the sun shines much brighter, the air is much milder and joy tingles in your stomach. 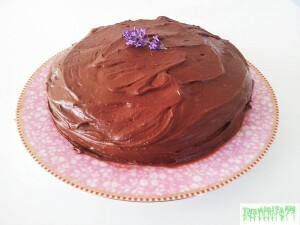 Not only is this cake the easiest possible to make cake, it is also low fat! (Well therefore the frosting is a sin!) This recipe is modified from brilliant Nigella Lawson. Preheat the oven to gas mark 180°C and line and butter one 20cm sandwich tin with removable bases. Now all you have to do is mix all the cake ingredients together with a wooden spoon until you have a combined and creamy mixture without lumps. Fill batter into the prepared tins and bake until n inserted toothpick comes out clean, which should be about 45 minutes. Let cool for 10 minutes before turning out of their tins onto a serving plate lined with four strips of baking parchment to form a square outline on it (this stops the frosting we will apply later from running on to the plate). To make the frosting, melt the butter and chocolate in a good-sized bowl either in the microwave or suspended over a pan of simmering water. Go slowly either way: you don’t want any burning or seizing. Add the golden syrup to the cooled chocolate mixture, followed by the sour cream and vanilla and then when all this is combined whisk in the sieved confectioners’ sugar and cocoa powder. 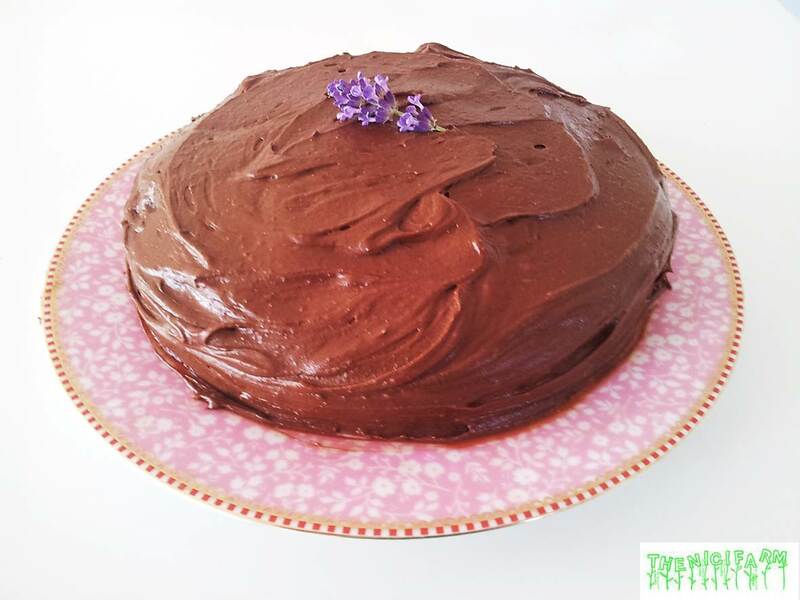 When you’ve done, you may need to add a little boiling water – say a teaspoon or so – or indeed some more cocoa powder sugar: it depends on whether you need the icing to be runnier or thicker; or indeed it may be right as it is. It should be liquid enough to coat easily, but thick enough not to drip off. Cut the cooled cake in half lengthwise and flip the top layer on a second plate. Spoon about a third of the frosting on to the center of the cake half and spread with a knife or spatula until you cover the top of it evenly. Sit the other cake on top, normal way up, pressing gently to sandwich the two together. Spoon another third of the frosting on to the top of the cake and spread it in a swirly, textured way. Spread the sides of the cake with the remaining icing and leave a few minutes till set, then carefully pull away the paper strips. The frosting will become a bit stiffer with time. If it is necessary to prepare the cake in advance (and you can withstand) you can store the cake under foil overnight in the refrigerator without losing too much of its quality. This cake tastes like heaven.